The Spanish house south of Wilshire at 10820 Wilkins Ave, LA CA 90024 received a price reduction today of 7.72% or $100,000, down to $1,195,000. This is the 2nd price reduction of the current listing term. According to the MLS, the home is a 3 bedroom / 2 bath, 1,678 sq ft home on a 6,211 sq ft lot. 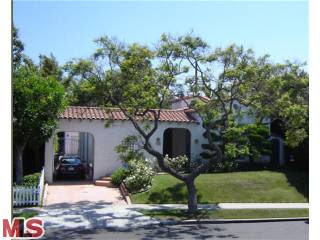 The 'Market Watch' information regarding this listing is it was previously purchased 2/26/08 for $1,200,000. With this new reduction, the home is now listed .42% less than the purchase price in 2008.